This is what passes for fresh air in Harbin, China. 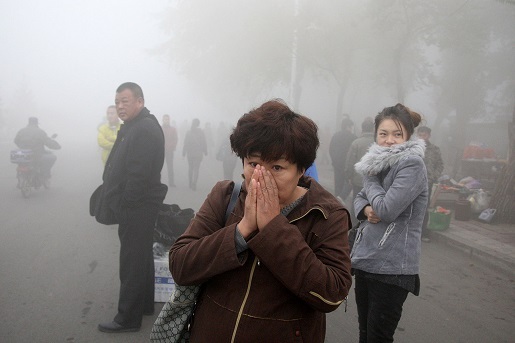 To say that China has an pollution problem is like saying fish have dry skin. Fish need water to live, and the Chinese may have the worst air quality in the known universe. There are planets in our solar system that have more breathable air than China, and none of the planets in our solar system can support life (except for Earth and those secret underground moon bunkers). China has tried many things to reduce their pollution issues, including scooping all the dead pigs out of the river and paying a bounty for cigarette butts, but the air quality problem isn’t one that’s going to get any better. In fact, it’s only going to get worse. The city of Harbin, China, shut down after air pollution reached an estimated 40 times the World Health Organization’s safety limit. Kids got a “smog day” off of school, airplanes were grounded, and roads were shut down as visibility dropped below 10 meters (32 feet). The problem with Harbin is its place in the northeast of China. That’s an industrial area, and Harbin is the center of manufacturing, so even in the best of times the air quality is bad. To make matters worse for Harbin, there has been a massive growth in the amount of cars on the road. As if that wasn’t bad enough, it’s winter. Winter in China means everyone turns on their heaters, and everyone turning on their heaters means more power is needed. More power needed means more coal is being burned, and more coal burning means air pollution so thick it’s like wading into the mouth of an active volcano.